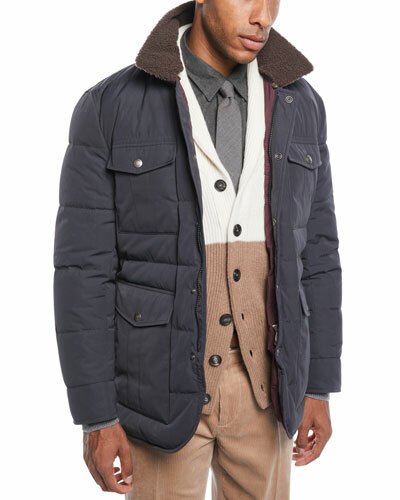 More Details Brunello Cucinelli Milano Quilted Shirt Jacket Details Brunello Cucinelli shirt jacket in quilted technical fabric. Spread collar; snap front. Long sleeves; snap cuffs. Flap pockets at chest. Shirttail hem. Nylon. Made in Italy. 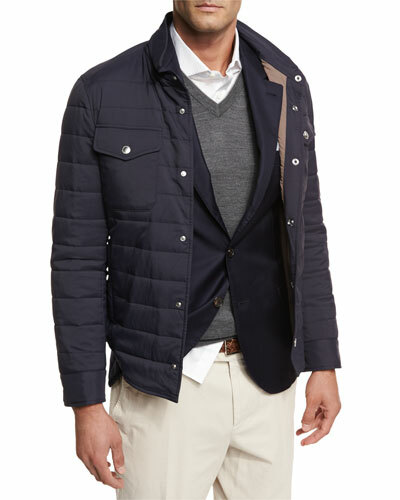 Brunello Cucinelli Milano Quilted Shirt Jacket Details Brunello Cucinelli shirt jacket in quilted technical fabric. Spread collar; snap front. Long sleeves; snap cuffs. Flap pockets at chest. Shirttail hem. Nylon. Made in Italy. More Details Brunello Cucinelli Suede Denim-Style Jacket Details Brunello Cucinelli denim-style jacket in suede. Spread collar; snap front. Long sleeves; snap cuffs. Chest flap patch pockets. Side slip pockets. Classic fit. Straight hem. Made in Italy. Brunello Cucinelli Suede Denim-Style Jacket Details Brunello Cucinelli denim-style jacket in suede. Spread collar; snap front. Long sleeves; snap cuffs. Chest flap patch pockets. Side slip pockets. Classic fit. Straight hem. Made in Italy. 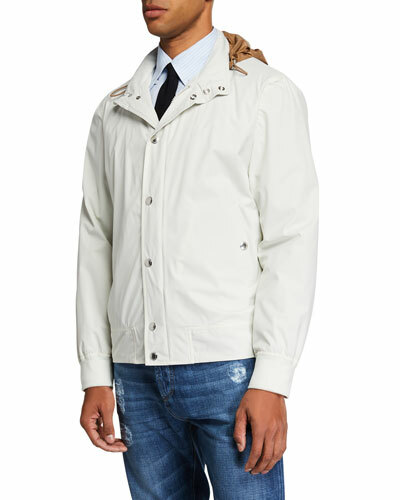 More Details Brunello Cucinelli Men's Vespa Moto Long Jacket Details Brunello Cucinelli Vespa moto jacket with front pocket and snap button detail. 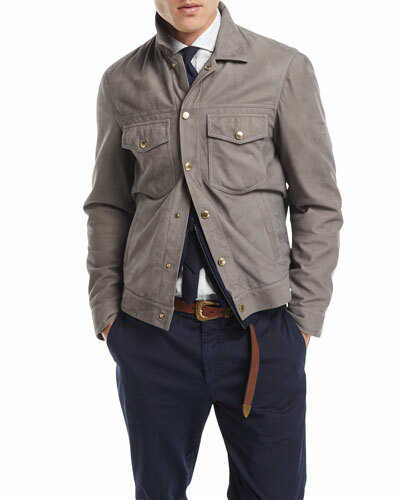 Stand collar; snap button front over concealed full-zip front. Side flap pockets; chest flap pockets. Long sleeves. Polyester/cotton. Made in Italy. Brunello Cucinelli Men's Vespa Moto Long Jacket Details Brunello Cucinelli Vespa moto jacket with front pocket and snap button detail. Stand collar; snap button front over concealed full-zip front. Side flap pockets; chest flap pockets. Long sleeves. Polyester/cotton. Made in Italy. 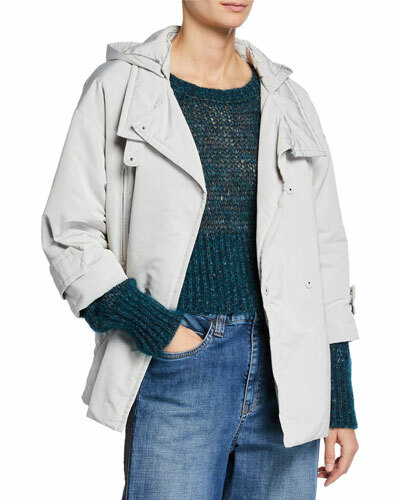 More Details Brunello Cucinelli Men's Padded Technical Jacket with Shearling Trim Details Brunello Cucinelli technical jacket in solid weave. Bleached, dyed lamb shearling (Spain) fur collar. Snap-placket hidden zip front. Four front flap pockets. Straight hem. Polyester/nylon/polyurethane. Goose feather fill. Made in Italy. 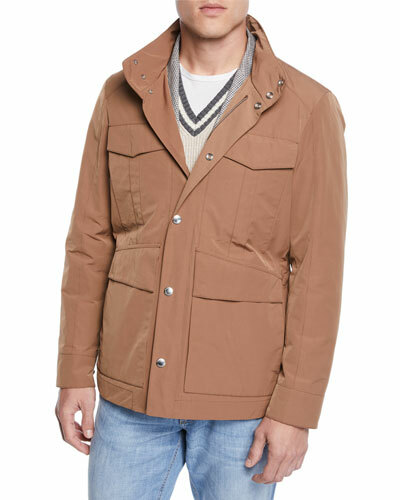 Brunello Cucinelli Men's Padded Technical Jacket with Shearling Trim Details Brunello Cucinelli technical jacket in solid weave. Bleached, dyed lamb shearling (Spain) fur collar. Snap-placket hidden zip front. Four front flap pockets. Straight hem. Polyester/nylon/polyurethane. Goose feather fill. Made in Italy. 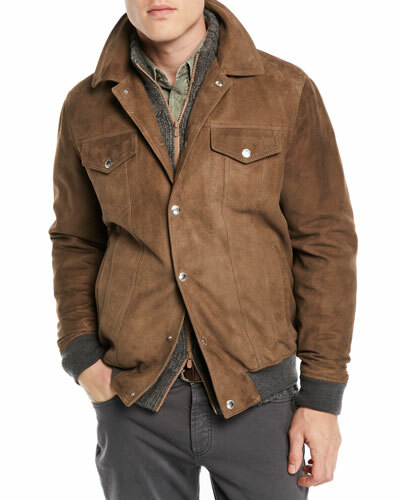 More Details Brunello Cucinelli Men's Fur-Lined Suede Safari Jacket Details Brunello Cucinelli safari jacket in suede. Dyed lamb fur (France) lining. Spread collar; snap-placket zip front. Four front flap pockets. 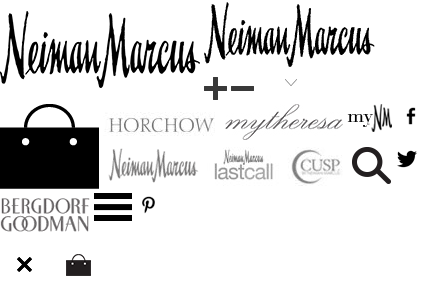 Cutaway hem. Made in Italy. 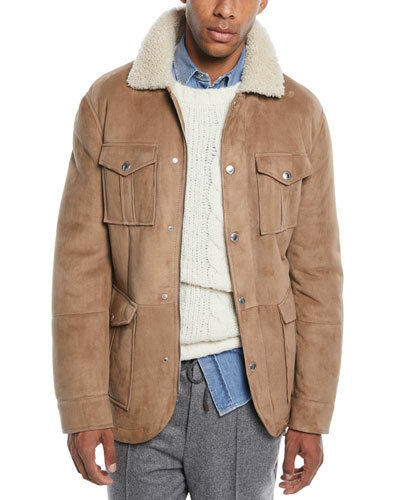 Brunello Cucinelli Men's Fur-Lined Suede Safari Jacket Details Brunello Cucinelli safari jacket in suede. Dyed lamb fur (France) lining. Spread collar; snap-placket zip front. Four front flap pockets. Cutaway hem. Made in Italy. More Details Brunello Cucinelli Men's Leather Biker Jacket Details Brunello Cucinelli biker jacket in lamb leather. Spread collar; snap front. Rib-knit cuffs. Flap chest pockets. Side slip pockets. Straight hem. Made in Italy. Brunello Cucinelli Men's Leather Biker Jacket Details Brunello Cucinelli biker jacket in lamb leather. Spread collar; snap front. Rib-knit cuffs. Flap chest pockets. Side slip pockets. Straight hem. Made in Italy. 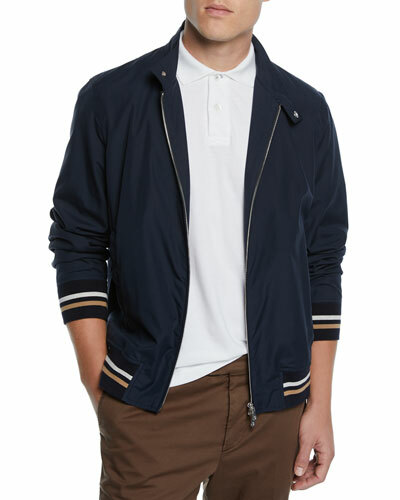 More Details Brunello Cucinelli Men's Moto Collar Bomber Jacket Details Brunello Cucinelli moto collar bomber with striped bottom detail. Stand snap collar; two-way zip front. Long sleeves. Side slip pockets. Ribbed hem and cuffs. Cotton. Made in Italy. 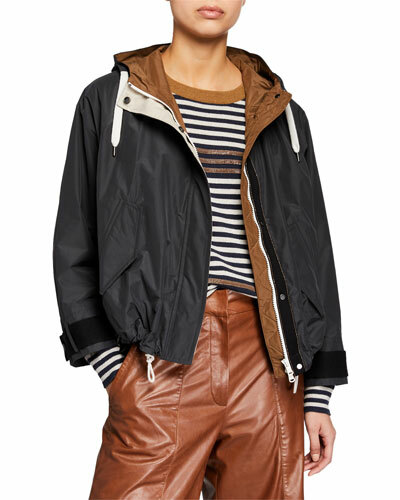 Brunello Cucinelli Men's Moto Collar Bomber Jacket Details Brunello Cucinelli moto collar bomber with striped bottom detail. Stand snap collar; two-way zip front. Long sleeves. Side slip pockets. Ribbed hem and cuffs. Cotton. Made in Italy.